The black-tailed mosquito, Culiseta melanura (Coquillett, 1902), belongs to the family Culicidae. 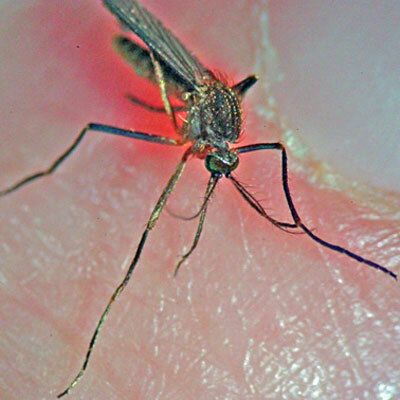 This species of mosquito is considered unusual because it overwinters as larvae while most mosquito species overwinter as either adults or eggs. Culiseta melanura is important because of its role in the transmission cycle of eastern equine encephalitis virus and potentially West Nile virus (Cupp et al. 2003, Molaei and Andreadis 2006). Figure 1. Adult female Culiseta melanura. Photograph by C. Roxanne Connelly, University of Florida. From the Integrated Taxonomic Information System and International Commission on Zoological Nomenclature (2010). Culiseta melanura is distributed in lowland swamp areas from southern Quebec through Maine and the Great Lakes area to southern Florida and as far west as eastern Texas (Crans and Mahmood 1998). This species is also found in the Caribbean (Horsfall 1955). Culiseta melanura larvae were collected in the northeastern state of Nuevo León, Mexico for the first time in 2001 (Ortega-Morales et al. 2009). Figure 2. Distribution of Culiseta melanura in North America. Map by C. Roxanne Connelly, University of Florida. Eggs: Culiseta melanura is a multivoltine species producing offspring at least twice per season. Eggs are oviposited in cool, acidic water with a pH of approximately 5.0 (Crans 1998) along the edges of swamps, flood plains and woodland pools (Hickman and Brown 2003). Approximately 100 eggs are laid on the water’s surface in bowl-shaped rafts 2.0 to 2.5 mm in diameter (Mattingly 1972). Individual eggs within the rafts are about 0.84 mm in length (Mattingly 1972). Culiseta eggs resemble Culex eggs in shape but are usually larger (Clements 1999). Figure 3. Culiseta melanura egg raft. Photograph by Deborah Arav and Leon Blaustein, University of Haifa. 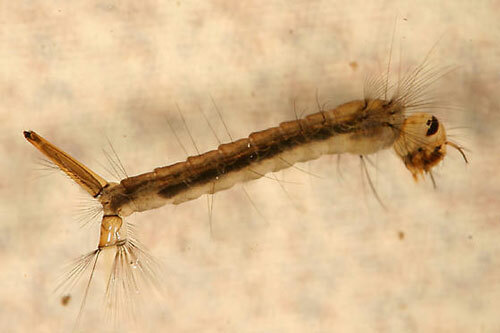 Larvae: The larvae of most mosquito species have a siphon (breathing tube) for acquiring air from just above the surface of water while submerged. 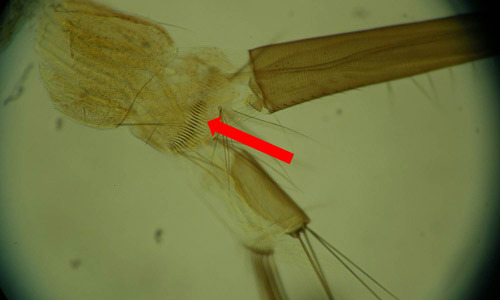 Culiseta melanura larvae have long siphons that can be distinguished from those of other mosquito larvae by the presence of two or three setae (hairs) located at the very base of their siphons (Darsie and Ward 2005). Other identifying characteristics of Culiseta melanura larvae are a row of 8-14 setae running horizontally down the siphon and a single row of bar-like comb scales located on the eighth section of the abdomen (Darsie and Ward 2005, Crans 2010). Figure 4. 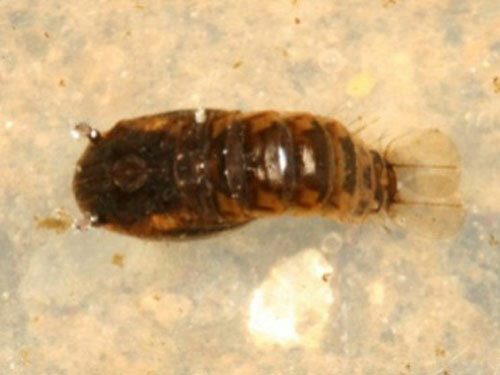 Culiseta larva. Photograph by Tom Murray, BugGuide.net. Figure 5. Pair of setae at base of siphon of Culiseta melanura larva. Photograph by Eva Buckner, University of Florida. Figure 6. 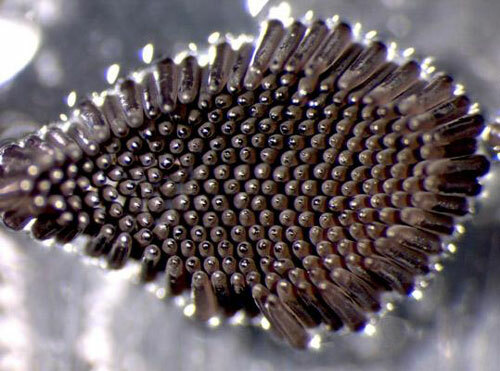 Bar-like comb scales located on the eighth section of the abdomen of Culiseta melanura larva. Photograph by Eva Buckner, University of Florida. Pupae: Mosquito pupae are comma-shaped because the head and thorax are fused and enlarged and the segmented abdomen attached to this region hangs down below it (Jackman and Olson 2002) and have two horn-like breathing structures. Culiseta pupae can usually be distinguished from Aedes pupae by the placement of small hairs on the ninth segment of their abdomens (Barr 1963). More specifically, a Culiseta melanura pupa can be recognized by the long hairs present on the second segment of its abdomen (Barr 1963). A second apical seta on the paddle distinguishes Culiseta melanura from other Culiseta pupae (Darsie et al. 1962). Figure 7. Dorsal view of Culiseta pupa. Photograph by Tom Murray, BugGuide.net. 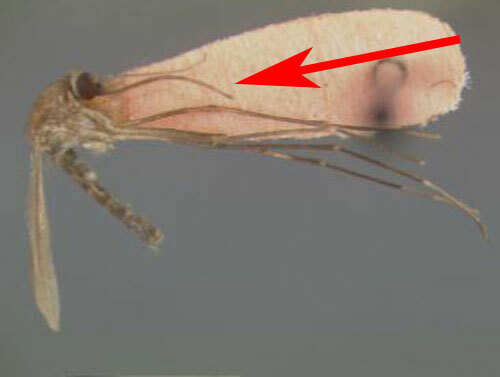 Adults: Culiseta melanura is a medium-sized mosquito that resembles Culex species because of its bluntly rounded abdominal tip (King et al. 1960). This species can easily be recognized by its unusually long, curved dark-scaled proboscis which is a cluster of tube-shaped mouth parts used for feeding (King et al. 1960). Palpi are also dark in color and short. The occiput of the head is covered with narrow yellow scales and dorsally divided by dark scales that stand upright. The lateral part of the head has a patch of white scales while the antennal tori are brown, turning darker on the interior. Its thorax is covered in scales that are mostly bronze-brown and golden-brown (Carpenter and LaCasse 1955). Pre-spiracular setae are present, post-spiracular setae absent. The pleura are speckled with dirty-white scales. The tergites of the abdomen are covered with dark-brown to black scales with a bronze to slightly purple reflection with small yellow-white patches on the lateral bases. Some segments may appear to have narrow yellow-white light bands. The ventral abdomen is covered in dirty white or yellow with sporadic dark-colored scales. The legs are primarily dark-scaled except at the posterior, which is pale. (Carpenter and LaCasse 1955). Wings are approximately 4.0 mm in length and cross veins 3-4 and 4-5 on vein 4 are set apart from each other at a length larger than the largest cross vein. The scales on cross veins are absent. Longitudinal veins are covered in dark, broad strap-like scales. The base of the subcosta on the underside of the wing has a cluster of dark setae (Carpenter and LaCasse 1955). Figure 8. Adult female Culiseta melanura showing long proboscis. Photograph by Eva Buckner and Lyle Buss, University of Florida. Figure 9. 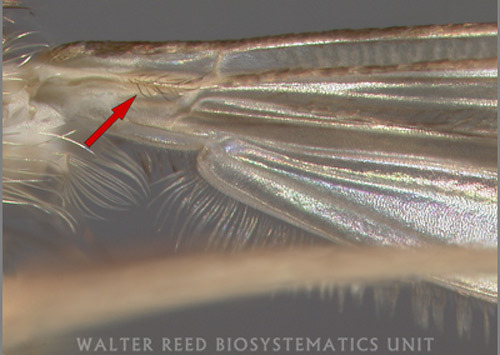 Distinguishing hairs arising from the ventral side of the wing of Culiseta melanura. Photograph by Judith Stoffer, Walter Reed Biosystematics Unit. Culiseta melanura has multiple generations per year in the southern part of its range (Horsfall 1955), but Mahmood and Crans (1998) suggest that the species has only two generations per year in the northeastern portion of its range due to cold temperatures. Adult females favor laying their eggs in habitats with acidic water and are normally captured near water with a pH of 5.0 or lower (Crans 2010). Females lay their eggs on the surface of water in underground crypts such as around the base of cypress, white cedar, or red maple trees or in rotted out stumps (Carpenter and LaCasse 1955). Larvae typically hatch within two days (Mattingly 1972). Culiseta melanura larvae are filter feeders and use their brush-like mouthparts to feed on decaying plant matter suspended in the water (Jackman and Olson 2002). Like most mosquito larvae, Culiseta melanura larvae mature in 4 to 10 days and then enter the pupal stage (Jackman and Olson 2002). If temperatures are cold larvae do not pupate and instead burrow into the bottom sediment and overwinter as 3rd and 4th instar larvae depending upon how late in the season eggs hatch. Those that hatch in the late summer to early fall overwinter as 4th instar larvae while those that are oviposited after the water temperatures have cooled overwinter as 2nd or 3rd instar larvae. Late instar larvae will pupate in April and emerge as adults by early May with several generations occurring each summer with two major peaks in adult populations approximately one month apart (Crans and Mahmood 1998, Crans 2004, Hickman and Brown 2003). The pupae remain in the water and do not eat. Temperature affects the length of the pupal stage which may last several days (Jackman and Olson 2002). Adult males feed only on nectar and other plant juices. Females also feed on nectar and plant juices but also require blood meals as a source of protein in order to mature their eggs (Jackman and Olson 2002). Adult female Culiseta melanura primarily take blood meals from birds such as the American robin, wood thrush, and gray catbird (Molaei and Andreadis 2006). Blood-feeding is at its highest during the first two hours after sunset but continues at a lower, constant level until sunrise (Hickman and Brown 2003). A few studies have shown that Culiseta melanura females take a low percentage of their blood meals from mammalian hosts, specifically, white-tailed deer, raccoons, domesticated cats, and humans (Molaei and Andreadis 2006, Molaei et al. 2006). Adult female mosquitoes typically live for about a week to a month, while males usually die shortly after mating (Jackman and Olson 2002). Because adult female Culiseta melanura primarily take their blood meals from birds, they are responsible for transmitting eastern equine encephalitis virus between birds (Crans 2010). Humans, horses, and other mammals become infected with eastern equine encephalitis virus when other mosquito species besides Culiseta melanura, such as Aedes, Coquillettidia, and Culex species take blood meals first from infected birds and then later take blood meals from mammals, transferring the virus to these hosts (CDC 2009). Molaei et al. (2006), showed that a small percentage of Culiseta melanura’s blood meals were from mammals, which suggests that Culiseta melanura can be involved in the transmission of eastern equine encephalitis virus directly to mammals. Eastern equine encephalitis virus can cause severe disease in human, horses, dogs, and some bird species (Zacks and Paessler 2010). Fever, headache, vomiting, seizures and coma may occur in humans infected with eastern equine encephalitis virus (Zacks and Paessler 2010). Neuroinvasive disease due to eastern equine encephalitis virus causes fatality in up to 70% of human cases, and over 200 human cases due to eastern equine encephalitis virus have been recorded in the U.S. since 1964 (CDC 2009, Zacks and Paessler 2010). It is particularly pathogenic in children, the elderly, and those with compromised immune systems although even healthy individuals can exhibit severe symptoms. A vaccine is available for horses, but not humans. Over 70 horses positive for eastern equine encephalitis virus are typically reported each year in the state of Florida alone, and eastern equine encephalitis virus can be fatal in up to 90% of unvaccinated horses (Bronson and Holt 2010, Zacks and Paessler 2010). Humans and equines are dead-end hosts for eastern equine encephalitis virus, meaning mosquitoes do not acquire the virus from them. Eastern equine encephalitis virus was detected in mosquitoes one hour after feeding on infected blood, which shows that this virus is highly virulent. Eastern equine encephalitis virus can affect the reproductive fitness of Culiseta melanura. Laboratory experiments showed a reduction in the number of surviving larvae from infected females although the infected females oviposited more eggs than uninfected females. Female mosquitoes infected with eastern equine encephalitis virus also had shorter life spans than uninfected mosquitoes (Scott and Lorenze 1998). Culiseta melanura is not considered to be an important vector of West Nile virus to humans. However, West Nile virus has been isolated from this mosquito species in many studies (Andreadis et al. 2001, Apperson et al. 2004, Godsey et al. 2005, Molaei and Andreadis 2006). Therefore it is likely that Culiseta melanura may transmit West Nile virus between birds that then serve as part of the mechanism sustaining West Nile virus in a region (Godsey et al. 2005). For more information on West Nile virus, see the UF/IFAS publication West Nile Virus. Because Culiseta melanura is not a major nuisance to humans it is not usually targeted for mosquito control. 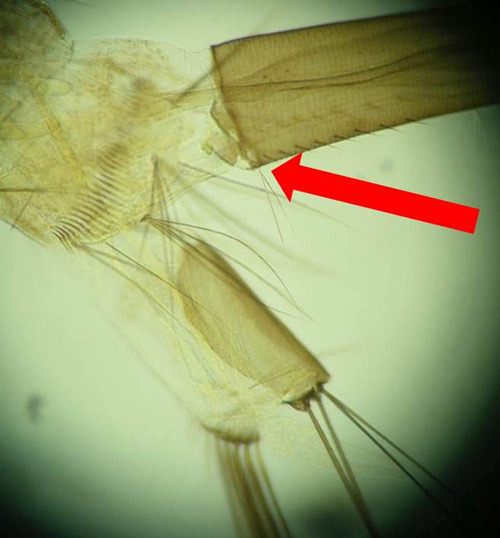 Efforts to reduce Culiseta melanura mosquito populations are usually made upon the appearance of eastern equine encephalitis virus seropositive sentinels in an area (Morris 1990). Large Culiseta melanura populations can be mitigated through aerial applications of insecticide (Morris 1990). Less effective ground-based adulticiding techniques may be used to control mosquitoes where aerial applications are not possible (Morris 1990). Applying larvicide to larval habitats may control larvae but reaching larval habitats can be difficult. Larval habitat reduction can be employed in an integrated pest management program. Because Culiseta melanura larval habitats are in swamps, typically protected by environmental laws, habitat manipulation is not possible. For this reason control, of this species is difficult. However, unlike mosquito species that spend a portion of their life in temporary water environments, fish that feed on mosquito larvae can be used with some success to control Culiseta melanura (Rusmisel et al. 1999). Andreadis TG, Anderson JF, Vossbrinck CR. 2001. Mosquito surveillance for West Nile virus in Connecticut, 2000: isolation from Culex pipiens, Cx. restuans, Cx. salinarius, Culiseta melanura. Emerging Infectious Diseases 7: 670-674. Apperson CS, Hassan HK, Harrison BA, Savage HM, Aspen SE, Farajollahi A, Crans W, Daniels TJ, Falco RC, Benedict M, Anderson M, McMillen L, Unnasch TR. 2004. Host feeding patterns of established and potential mosquito vectors of West Nile virus in the eastern United States. Vector-Borne and Zoonotic Diseases 4: 71-82. Barr RA. 1963. Pupae of the genus Culiseta Felt II: Descriptions and a key to the North American species. Annals of the Entomological Society of America 56: 324-330. Carpenter SJ, LaCasse WJ. 1955. Mosquitoes of North America (North of Mexico). University of California Press, Berkeley, California. Clements AN. 1999. The Biology of Mosquitoes, Volume 2. Sensory Reception and Behavior. CABI Publishing, New York. Crans WJ. 2004. A classification system for mosquito life cycles: Life cycle types for mosquitoes of the northeastern United States. Journal of Vector Ecology 29: 1-10. Cupp EW, Klingler K, Hassan HK, Vlguers LM, Unnasch TR. 2003. Transmission of eastern equine encephalomyelitis virus in central Alabama. American Journal of Tropical Medicine and Hygiene 68: 495-500. Darsie Jr RF, Morris CD. 2000. Keys to the adult females and fourth-instar larvae of the mosquitoes of Florida (Diptera, Culicidae). Technical Bulletin of the Florida Mosquito Control Association. 159 pp. Darsie Jr RF, Ward RA. 2005. Identification and geographical distribution of the mosquitoes of North America, north of Mexico. University Press of Florida, Gainesville, Florida. Darsie Jr RF, Tindall EE, Barr AR. 1962. Description of the pupa of Culiseta melanura. Proceedings of the Entomological Society of Washington 3: 167-170. Godsey MS, Blackmore MS, Panella NA, Burkhalter K, Gottfried K, Halsey LA, Rutledge R, Langevin SA, Gates R, Lamonte KM, Lambert A, Lanciotti RS, Blackmore C, Loyless T, Stark L, Oliveri R, Conti L, Komar N. 2005. West Nile virus epizootiology in the southeastern United States, 2001. Vector-Borne and Zoonotic Diseases 5: 82-89. Horsfall W. 1955. Mosquitoes, Their Bionomics and Relation to Disease. The Ronald Press Company, New York. ITIS. (2010). Culiseta melanura (Coquillett, 1902). Integrated Taxonomic Information System. (4 April 2013). Jackman J, Olson J. (2002). Mosquitoes and the diseases they transmit. Texas AgriLife Extension Service, Texas A&M System. (4 April 2013). King W, Bradley G, Smith C, McDuffie W. 1960. A handbook of the mosquitoes of the southern United States. Agriculture Handbook No. 173. United States Department of Agriculture, Washington D.C.
Mahmood F, Crans WJ. 1998. Effect of temperature on the development of Culiseta melanura (Diptera: Culicidae) and its impact on amplification of eastern equine encephalomyelitis virus in birds. Journal of Medical Entomology 35: 1007-1012. Mattingly PF. 1972. Mosquito eggs XXI Genus Culiseta Felt. Mosquito Systematics Journal 4: 114-127. Molaei G, Andreadis TG. 2006. Identification of avian- and mammalian-derived bloodmeals in Aedes vexans and Culiseta melanura (Diptera: Culicidae) and its implication for West Nile virus transmission in Connecticut, USA. Journal of Medical Entomology 43: 1088-1093. Molaei G, Oliver J, Andreadis TG, Armstrong PM, Howard JJ. 2006. Molecular identification of blood-meal sources in Culiseta melanura and Culiseta morsitans from an endemic focus of eastern equine encephalitis virus in New York. American Journal of Tropical Medicine and Hygiene 75: 1140-1147. Ortega-Morales AI, Elizondo-Quiroga A, Gonzalez-Villarreal A, Siller-Rodriguez QK, Reyes-Villanueva F, Fernandez-Salas I. 2009. First record of Culiseta melanura in Mexico, with additional Mexican records for Aedes sollicitans. Journal of the American Mosquito Control Association 25: 100-102. Scott TW, Lorenz LH. 1998. Reduction of Culiseta melanura fitness by eastern equine encephalomyelitis virus. American Journal of Tropical Medicine and Hygiene 59: 341-346. Zacks MA, Paessler S. 2010. Encephalitic alphaviruses. Veterinary Microbiology 140: 281-286. Authors: Eva Buckner, Angelique Showman, and C. Roxanne Connelly, University of Florida, Entomology and Nematology Department. Photographs: Jason Williams, Virginia Mosquito Control Association; C. Roxanne Connelly, Eva Buckner and Lyle Buss, University of Florida; Tom Murray, BugGuide.net; Deborah Arav and Leon Blaustein, University of Haifa. Publication Date: September 2012. Latest Revision: June 2016.